For more details and complete ticket information, visit www.311.com/shows. Highlights include a special 4th of July weekend concert event at Las Vegas’ Mandalay Bay Beach where the band will play two special shows with fireworks overhead on both nights (July 2 & 3). In addition, 311 will make headline appearances at several festivals and radio events. 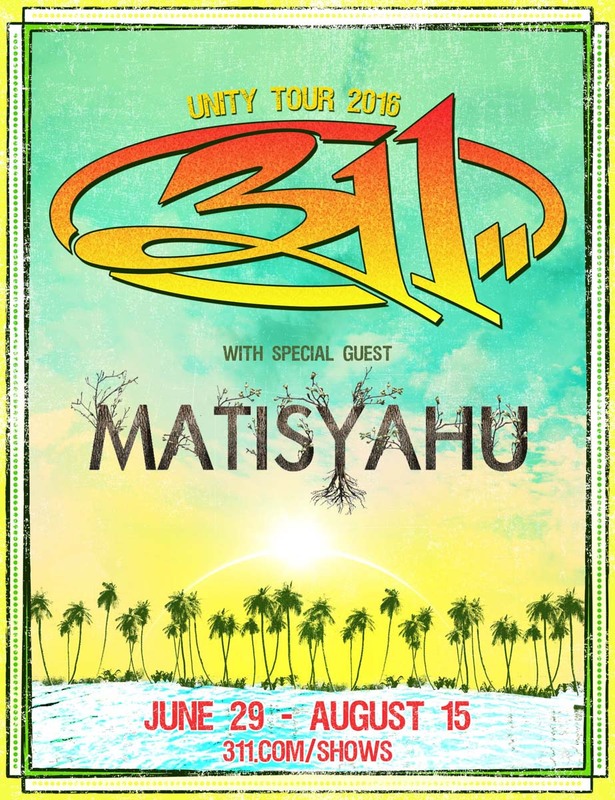 311 recently celebrated “311 DAY” with two special shows (3/11 and 3/12) at the Smoothie King Center in New Orleans. The arena of diehard fans bought tickets from all 50 US States & 15 countries. Billed as “the ultimate 311 concert experience,” the 311 DAY show includes an extended setlist of hits and rarities; backed by state-of-the-art lighting and special effects. 311 played 85 different songs over the weekend, including 4 with a 25-person Gospel Choir joining them. 311 are currently writing and recording their 12th studio album for projected release in early 2017. In celebration of the band’s 25th year anniversary, 311 released their box set ARCHIVE (June 2015), featuring 4 CDs. 81 tracks of b-sides, bonus tracks, pre-production recordings and demos from 1992-2014. Plus a 60 Page Book of rare photos and memorabilia. Their latest studio album STEREOLITHIC (March 2015), debuted at #6, marking the the band’s 9th consecutive album to debut in the top 10 on Billboard‘s Top 200 Album Chart. The album also entered No. 1 on both the Rock and Indie Charts. Over the course of their amazing career, 311 has sold nearly 9 million albums in the U.S. alone. They’ve had 9 top 10 radio hits, including three No. 1’s. Their list of hits includes “Down,” “All Mixed Up,” “Amber,” “Love Song,” “Come Original,” “Beautiful Disaster,” “Don’t Tread On Me,” “Hey You” and “Sunset In July.” For 11 consecutive years, the band headlined amphitheaters across the U.S. with their summer “Unity Tour.” They also host a bi-annual Caribbean Cruise – that has gone to Turks & Caicos, Bahamas & Jamaica, and is attended by thousands of 311 fans from around the world.